We have built a reputation for innovative design, superb craftsmanship and an attention to detail. We take pride in creating spaces that work for our clients & beautiful designs that stand the test of time. 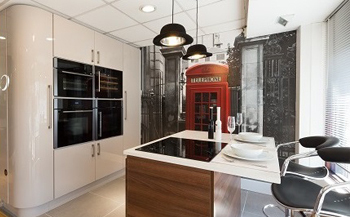 Whether you choose a contemporary, traditional, gloss, painted, handleless or in-frame kitchen, all our kitchens are manufactured to suit each individual design and specification and installed by our expert fitters. Pared back, simplistic with European styling Elemental has been designed to be basic but powerful. Handless doors & slimline laminate worktops create a clean, functional space, perfect for small builders, starter homes or crash pads. Think long brunches, baking bread, family meal times & homework at the table, kitchens now have to be as diverse as their family’s needs. Designed with classic door styles that stand the test of time & laminate countertops that are easy to keep clean & hard wearing. La Famiglia will grow with your family. Luxe is indulgent, desirable & extravagant like expensive chocolate, perfume & French champagne. Perfectly showcasing our innovative designs, superb craftsmanship and attention to detail. 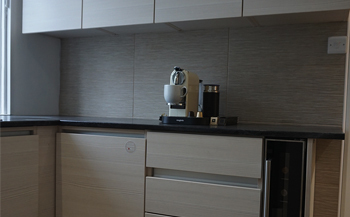 Luxe, as it’s name denotes, is our premium range of kitchens. Featuring acrylic doors, solid surface worktops & creative storage solutions, Luxe is designed to inspire. 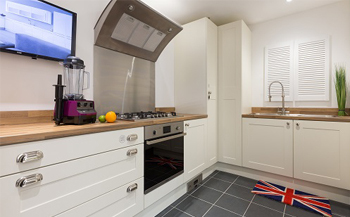 Having worked with some of the big brand appliances we have a wealth of knowledge & can confidently recommend appliances to suit your kitchen and lifestyle. Whether you aspire to a pyrolytic oven that cleans itself or an American style fridge freezer with ice dispenser we can reassuredly source these for you. For over 60 years now, Smeg appliances have been widely regarded as tasteful and elegant products which combine effortlessly to compliment your mood and style – thanks to Smeg’s partnerships with world famous architects. The Smeg Group, thanks to a corporate culture which dictates that maximum emphasis be placed on product quality, technology and design, is consequently known all over the globe as one of the key representatives of “Made in Italy” standards. Franke is the World’s largest manufacturer of kitchen sinks, and is at the forefront of research and development of new materials and products for the kitchen.The company was formed in 1911, and Franke produced their first sink in 1925. Now, with kitchen design playing a key role in home improvement, the kitchen sink has ceased to be a mere workaday item. Now it is designed to be good looking, even fashionable, as well as functional. And options are much wider in terms of materials, colours, styles and formats. Franke is always at the forefront of design implementation in the manufacture of new models and materials.